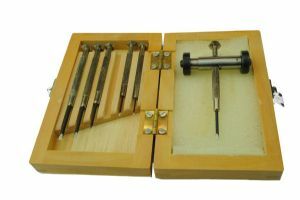 Watchmakers screwdriver sharpener and 6 piece watchmakers screwdriver set. Overall size - approx. 45mm long x 15mm diameter. Will hold screwdrivers up to 5mm in diameter. Watchmakers screw driver set 6 piece sizes 1MM - 3MM in a wooden box.